The longest running and undefeated noontime show in the Philippines, Eat Bulaga!, will startairing its first franchise in Indonesia starting today, July 16. CSTV Indonesia brought the noontime show after closing a deal with TAPE Inc., producer of the award-winning Kapuso variety show. 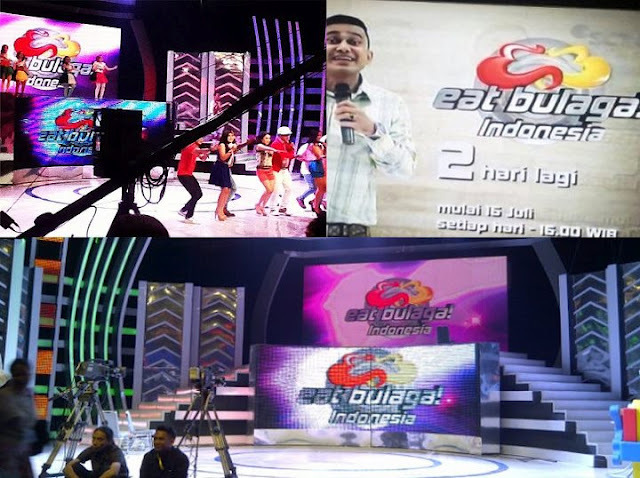 Similar to the original version, Eat Bulaga Indonesia will have multiple hosts. They are Uya Kuya, Farid Aja, Reza Bukan, Ramzi, Narji, Ciripa, Rian Ibram, Rio Indrawan, Steven, Leo Consul, Selena Alexandria, Jenny Tan, Bianca Lizza and Christie Julie. According Harsiwi Achmad, the program is in addition to entertaining, it also contains elements of education, spread positive values ​​and get closer to it with the community. "So in addition to entertaining yet also entertaining education, fun but touchy. So we want this program a success as the Filipinos who can be seen for 33 years," said Director of Programs and Production at Studio Penta SCTV, Kebon Jeruk, West Jakart Friday (13/7) evening. Eat Bulaga Indonesia is not 100 percent copied from the Filipino version. The franchised version has some of the contents adapted though such as Bolagaan, Karaoke Stud, Indonesia genius and One For All, All For One.